When I set up this blog, I also set up another. I put a few posts on that one and waited until I had this one going at a consistent speed before I began posting in earnest at the other. The subject matter is completely different as it deals with a more somber human condition – Taking Care of Mom and Dad. You can find it here: http://takingcareofmomanddad.wordpress.com/ It warehouses all the information (okay, well it WILL) that I have learned during my 20+ years working with the aged, including my own experience moving home to care for my dad full time until his death 2 and ½ years later. Now, I’m a caregiver to my mom and if it weren’t for Top Girl, I would be doing it alone because I am an only child. It only has about 10 posts right now but I will grow it day-by-day. So, if you too are experiencing issues taking care of parents, grandparents, adult disabled siblings etc… please go take a look and see if it fits your needs. 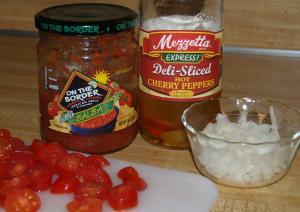 Now, on to the recipe. Top Girl came over last night to help me with some bloggy stuff while her husband and Rocket spent time with his parents. The weather was cool, rainy, and dreary so some warm comfort food was in order but working full time prevents a long-involved recipe and prep so as I drove home, I went through my mental index file of go-to recipes. It’s a short list so it didn’t take too long! 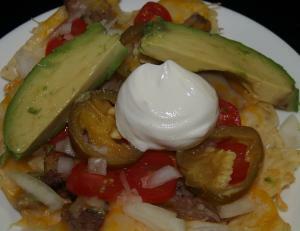  I decided Carne Asada Nachos fit the bill and would only take about 15 minutes to prepare and cook – my kind of meal! 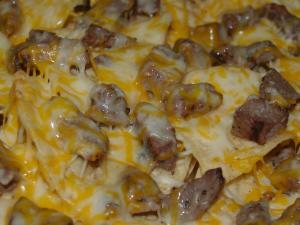 Spray a foil covered pan with non-stick spray and place chips, beef (or chicken), and shredded cheese on top. Place in oven for about 10 minutes. 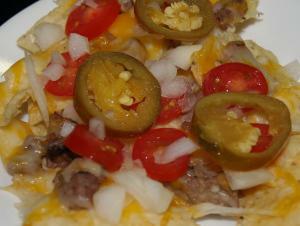 Once you take them out, place them on a plate and top with your favorite garnishes. 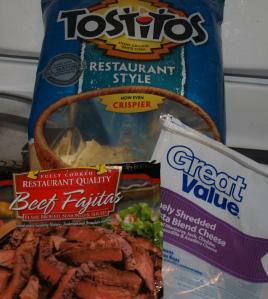 Top Girl and I love avocado and sour cream, and surprise! Mr. Picky-eater does not.